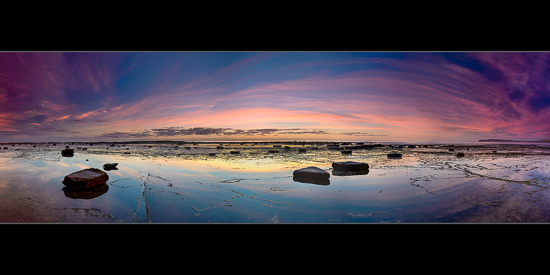 As I was already setup for a vertical composition I then decided to put together some frames for a stitched reef panorama. Being lazy yet again I just zoomed the lens I had on at the time (the 16-35/4) as much as I could (35mm) rather than changing lenses to the 24-70. This first one was a bit of a test – and it was a little funky because I still had the polariser on and things go awry the closer we get to pointing 90° to the rising sun – i.e. the left and right of this panorama. Still I liked what the clouds and the reflection were doing so persisted with the panorama. On the left we have the Long Reef headland (with a nice golf course up on the top) with the rocks on the reef scattered all around us and Jason Baker is over on the right taking a long exposure. I had to adjust the exposure a little on the way around with this one – because some of the frames are pointing towards where the sun was rising and some away from it and the light levels were changing rapidly in the few minutes it took to take all the frames.